I know I start a bunch of my OOTD posts exclaiming how cute the outfit is, but seriously, how cute is this! 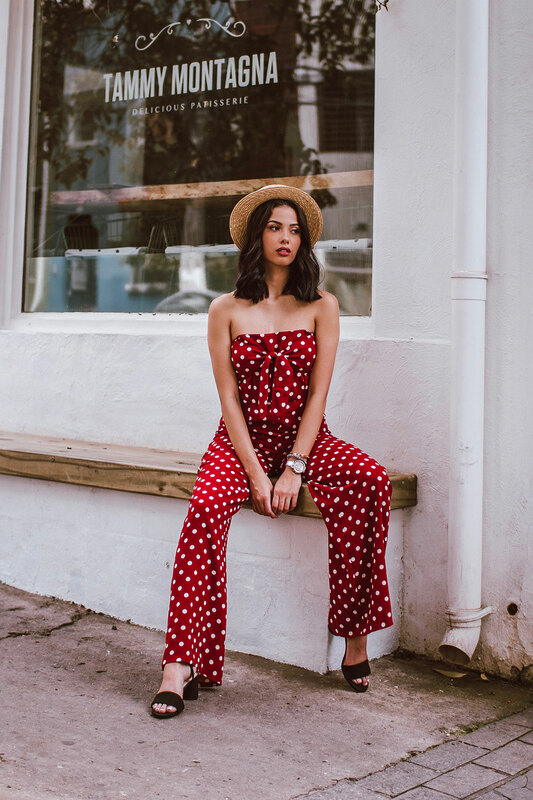 This Red Polka Dot Jumpsuit is from Nasty Gal and it is A HEAD TURNER! The polka dot pattern covers the whole suit and is the perfect spring/summer/fall outfit. Its strapless and zips up the back, but my favorite part about this jumpsuit is the tie in the front. I’m wearing simple Zara sandals that have a small heel. The jumpsuit does the talking, so these shoes are a subtle compliment. The straw hat is from Forever 21, and I love this addition. It is the icing on the cake, really! You could use different types of hats, such as a floppy hat or a beret, but I love this one.